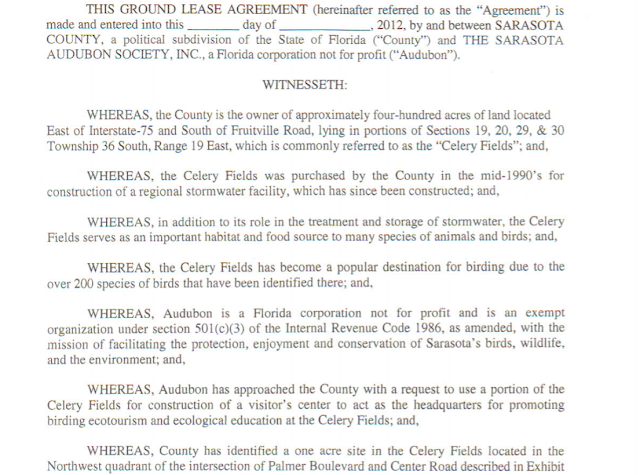 "Celery Fields is a national caliber example of how recreation, stormwater management and conservation strategies can be leveraged to achieve multiple environmental and recreational benefits, including becoming an international birding destination." 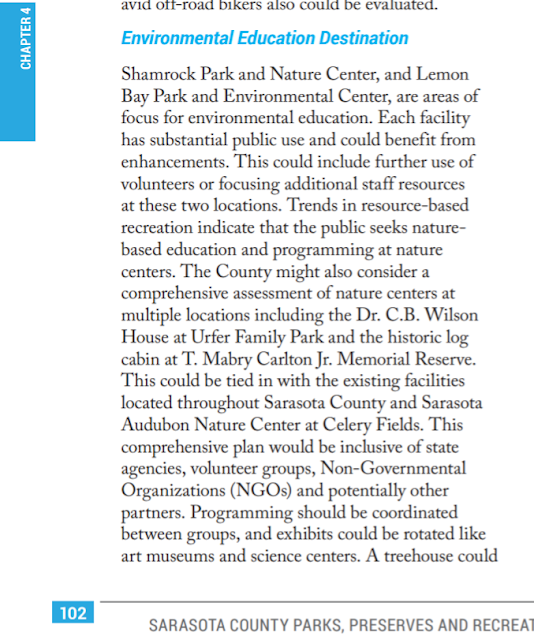 Sarasota County Parks 2016 Master Plan, p. 7. "Trends in resource-based recreation indicate that the public seeks nature-based education and programming at nature centers. The County might . . . consider a comprehensive assessment of nature centers at multiple locations . . .. This could be tied in with the existing facilities . . . and Sarasota Audubon Nature Center at Celery Fields." Sarasota County Parks 2016 Master Plan, p. 102. "In addition to its role in the treatment and storage of stormwater, the Celery Fields serves as an important habitat and food source to many species of animals and birds . 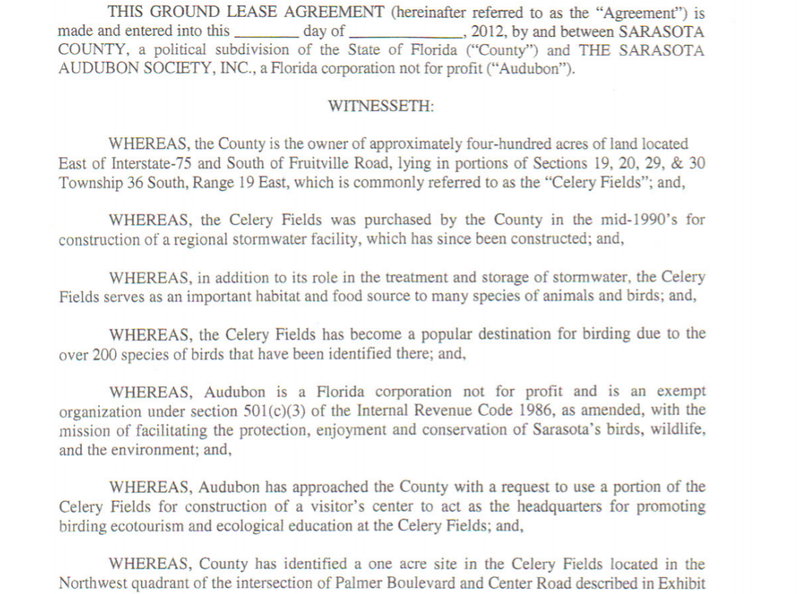 . ." Sarasota County Ground Lease Agreement with The Sarasota Audubon Society, Inc., 2012. 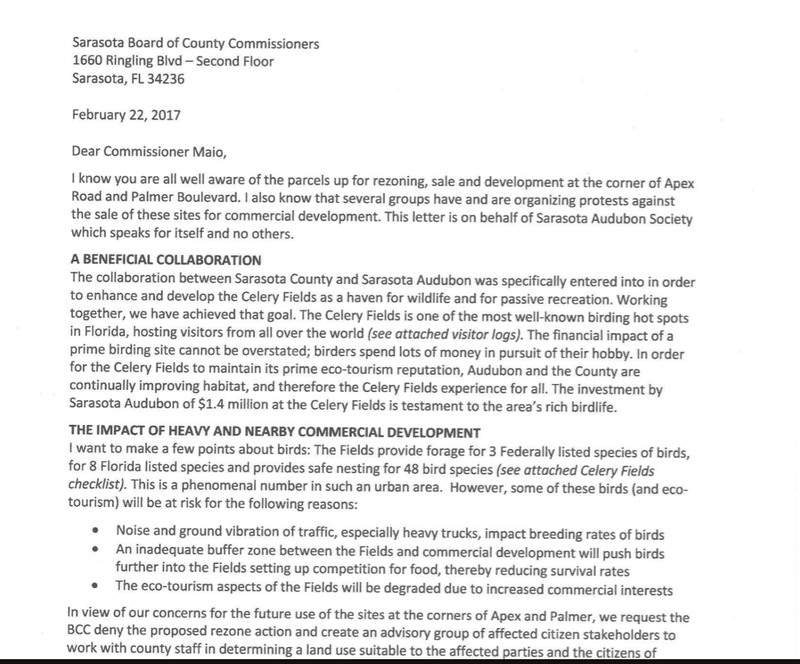 Letter of 2.22.17 from Sarasota Audubon Society to Commissioner Al Maio recommending denial of industrial rezoning of the Quad Parcels last year. 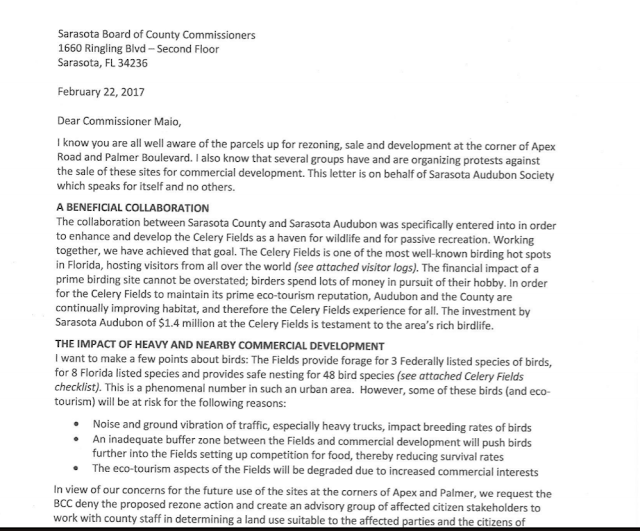 "A phenomenal number" of federal and state listed birds have been found at the Celery Fields, whose nesting and feeding would be "at risk." Audubon recommended county create "an advisory group of affected citizen stakeholders to work with county staff in determining a land use suitable . . ."
The full Audubon report includes a Celery Fields species checklist and statistics on tourist visits. The Lambert Advisory Report of August 2018 notes the existing zoning for the Quad Parcels: "All commercial and industrial development is prohibited." It's a full circle -- in view of the changes to the area -- specifically the Celery Fields birding and recreation area -- what possible justification can there be for rezoning these parcels for industry?